We had only one day in Auckland and decided to do this-What a fantastic guide and trip Much longer than we expected and we would have loved to stop at the small towns with the cows done up for a treat. We could have done with a little less scenery and a stop in the town but it was amazing.Plan for 12 hours.. This was absolutely amazing. Great and fun guide who really gave us a behind the scenes tour and stories as we drove to see the amazing sites. Our whole group will remember this forever. This was an amazing day! Our tour guide was prompt and so, so polite she made the trip to Waitomo and to the movie set a real pleasure with her delightful conversation. It was surprisingly nice to ride in private transport as opposed to big busses, and the two locations the caves and the movie set were lots of fun. We would highly recommend this tour! Amazing tour and tour guide. We had an absolutely amazing time. Highly recommended for anyone visiting New Zealand and Auckland. Hobbiton is amazing. The caves were like nothing we had ever visited. The journey from Auckland was a bit long but worth it. Sofia was a great tour guide, we had a very enjoyable day. Only reason this gets a 4 and not a 5 had nothing to do with the tour company but only that because of a rising river we were unable to do the full Waitomo caves experience had to go out the same way we went in which really backed things up. Had a really enjoyable day and would highly recommend. Time Unlimited private tour was the best. Our tour guide / driver Daniel is very friendly, knowledgeable polite and accommodating. He made our tour pleasant and comfortable. We had a great time and worthed. 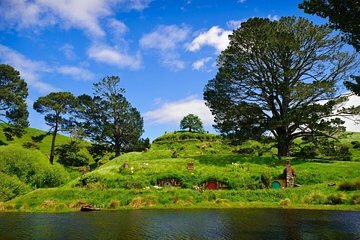 This private tour worth the price, with friendly and knowledgeable tour bus driver, tour guides at the Caves and at The Hobbiton movie set. We had a great , enjoyable whole day. Highly recommend to people who have not been there before. The buffet lunch was fine if people like BBQ foods, the homemade carrot cakes was excellent. It was the best day of our holiday...We couldn't have asked for anything better.